Note that we can offer you the same exact door, only with flush pegs. Our Albany or Amesbury doors located in the Shaker collection, combined with single or double flush walnut pegs in the corner give a very similar appearance for about $12-15 less per door. 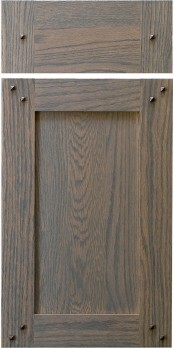 A perfect door to use Quarter Sawn Red or White Oak.